Lord Krishna, one of the Dasa Avatars (ten incarnations) of Mahavishnu, is known to have performed many miracles right from a very young age. This poster shows one of his Leelas, the lifting of the Govardhana Mountain. Lord Indra, the King of the Devas (Gods) gets furious when He sees people worshipping Krishna instead of Him. He hence decides to teach the Yadavas a lesson for their misdemeanor. Hurling His Vajra Ayudha (his weapon, the bolt of lightning), He wills torrential rain to befall the hamlet of Vrindavan. 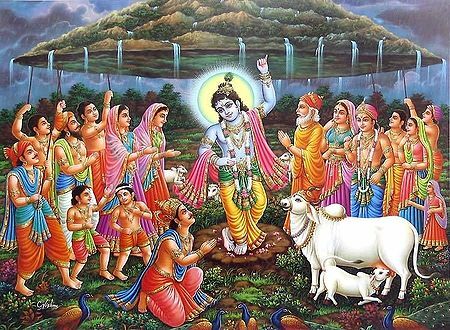 The people of Vrindavan are struck with terror and beseech Krishna to save them from the torrential rain. Young Krishna, knowing what exactly caused the rain, merely smiles and effortlessly lifts up the Govardhana Giri (mountain) with the little finger of His left hand. All the villagers gather their animals together and huddle up under the shelter of the mountain. Indra realizes Krishna's divinity, is humbled and immediately relents his actions.